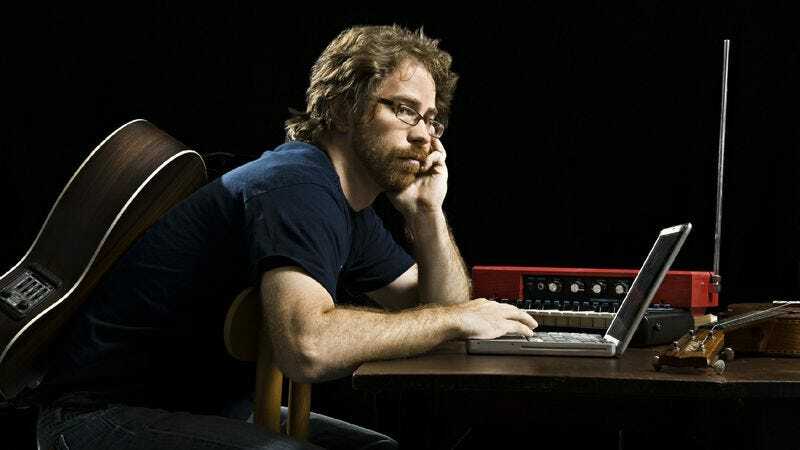 The hater: Singer-songwriter Jonathan Coulton has been writing and releasing his slightly off-center tunes—“Code Monkey,” “Re: Your Brains,” songs for the Portal videogames, and so on—into the musical ether since 2003, finding relative success without the help of a record label. While Colton’s latest solo record, Artificial Heart, came out last year, his new LP with The Long Winters’ John Roderick just came out. One Christmas At A Time is, as the name suggests, a holiday-themed record and, in its deluxe edition, comes complete with a Christmas-sweater T-shirt and custom tree ornament. As he cashes in on the holiday cheer with his own songs, The A.V. Club asked Coulton what Christmas song he just can’t abide. Jonathan Coulton: “Jingle Bell Rock,” for me, exemplifies succumbing to your worst impulses as a songwriter. It’s one of those Christmas songs that mostly feels like it’s trying to cash in on a couple of things, one of them being the popularity of the Christmas song “Jingle Bells,” which no one will deny, and the newfound popularity, at the time, of rock music. You can almost hear the discussion. They’re like, “You know what we should do? We should combine two things that America loves: ‘Jingle Bells’ and rock music.” Then it’s “ka-ching” from there. What you end up with is a song that, first of all, most modern listeners would hear this song, and say, “Well, where is the rock, exactly?” Mostly it sounds like jingle bell jazz. I recognize rock was young, but it’s sort of the equivalent of if I decided today that I was going to do a song called “Jingle Bell Rap.” [Laughs.] It would be about as good. “Jingle bell rap. Shop at the Gap.” That’s half the song right there. I recognize it’s a bad song, so I have the decency to stop writing it. AVC: There’s not a lot of lyrical message to it. JC: It’s just kind of jingle, jingle, jingle. If you could say that the song is about anything—other than the obvious, which is jingle bells—I think he’s describing some kind of a party when everybody gets together and straps jingle bells to their bodies and dances. AVC: They mix and mingle. JC: They’re mixing. They’re mingling. The jingle bells are chiming in jingle-bell time. It’s the jingle hop, right? “The jingle hop has begun,” he says, which, this is not a tradition that I’m aware of, when everybody gets together and straps on bells and dances. I don’t know if he was trying to launch this tradition or what. It’s just very confusing. It’s almost like he’s trying to create this imaginary world in which everything is 100 percent based on jingle bells. They’re having a jingle hop. They’re dancing and prancing in Jingle Bell Square. It’s jingle bell time. They’re jingling around the clock. Anybody who has ever given a set of jingle bells to a toddler can tell you that nobody really wants to hear a lot of jingle bells. AVC: To its credit, at only about two minutes long, it’s fairly short. JC: [Laughs.] That’s a good point. This song is blessedly short. It is that Tin Pan Alley format. It’s just the two sections: The verse with the little built-in chorus line at the end and the B-section. It is mercifully short. That is true. That is maybe the best thing you can say about this song. AVC: It was written by a PR man and a guy who wrote ad copy. JC: Are you kidding me? I didn’t even know that, but it sure smells funny, doesn’t it? JC: “What is this rock music? Let’s combine rock music with jingle bells, the thing that everybody loves,” which totally misses the point. I am not anti- the sound of jingle bells. I, like many people in the world, have a nostalgia trigger that is pulled by the sound of jingle bells, and indeed, the sound of the song “Jingle Bell Rock.” But it’s such an easy trigger to pull that I feel like I just want people to work harder when they’re writing a song. Just try a little harder. That’s my only request. AVC: Do you have any jingle bells on your Christmas record? JC: I knew you were going to ask that. The answer is yes. We do. We use them, I would say, somewhat tastefully. We don’t talk about them, because the jingle bells themselves are not the thing that people love. Even in the song “Jingle Bells,” which describes riding in a one-horse open sleigh, dashing through some snow, it sounds lovely. It’s a lovely evening. The jingle bells are sort of incidental to the experience. They’re not the focus of the experience. This song sort of flips that so that suddenly the jingle bells are the most important thing. It would be like if I heard the song “Chestnuts Roasting On An Open Fire” [typically titled “The Christmas Song”] and decided to write an entire Christmas song about the smell of smoke. That is not the thing that we love. It’s the larger context that matters. AVC: This song isn’t really about anything, but do you think that Christmas songs have to be about something? Your record has songs about family and about trouble, and you guys obviously went into it with a point to make. But a lot of perfectly nice Christmas songs are just about nighttime or snow. JC: I recognize I’m kind of a jerk to say that a meaningless Christmas song is not deep enough or important enough. I recognize it makes me a bit of a monster, but as a songwriter, there are so many easy outs that beckon you. When I think about my job as a songwriter, a large part of it is avoiding those sand traps and trying to actually make something that’s meaningful. Yeah, we did set out to write songs that had some specific meanings and talked about some things associated with Christmas that maybe hadn’t been addressed before. Like that song, “The Week Between,” about that awesome week between Christmas and New Year’s that should be a holiday in and of itself. “Uncle John” was about this annoying relative, which I think everybody can relate to. The one trap that we fell into is a song called “Christmastime Is Wunnerful,” which is basically the headline repeated over and over again for five minutes. [Laughs.] That song is not about very much, other than the fact that Christmastime is wonderful. I do think there is a place for it. I just feel like this particular song, “Jingle Bell Rock,” has never really felt like a heartfelt sentiment to me. I guess that’s my main quibble with it. It’s okay to write a song about feeling cozy if you really like feeling cozy, which, let’s face it, who doesn’t? But it’s another thing entirely to write a song about an imaginary dance where everyone has bells strapped to their bodies, because that’s not a thing that people do. AVC: “Jingle Bell Rock” has a pretty solid place in pop culture. It’s the opening to Lethal Weapon. It was in Mean Girls. We hear it again every year on TV in holiday episodes or specials. In theory, it thrives not because it’s a good song, but because it’s a two-minute, media-friendly song about nothing. JC: Right. No, believe me, perhaps my hatred of this song really comes from my envy of the fact that this is a song that probably took five minutes to write and will be played until long after all of us are dead. I think you’re right. I think it has assumed a relatively important place in popular culture, as far as Christmas music goes. It’s going to end up on all the Christmas music collections for a long time. Its popularity, I would say, is largely based on Baby Boomer nostalgia, and people of my generation have had the things that Baby Boomers love jammed down our throats our whole lives. And I, for one, think it’s time to shake off the shackles of our cultural masters and begin to create our own nostalgia. JC: No pressure, right? [Laughs.] It’s presumptuous to say you’re going to set out to write a song that would be important 50 years from now. That’s a challenge. If everybody knew how to do that all the time, people would be doing it constantly on purpose. I think most of the time they do it by accident. We set out to do a couple of things. We set out to write songs that felt like honest descriptions of sentiments that we feel about Christmas. I think we also tried to write as unironically as possible. We didn’t want to write a snarky Christmas record, because we do love Christmas. There are things that are great about Christmas. I think really we were just shooting for an honest reflection of ourselves and of our perceptions of Christmas and we hope that it resonates with other people. AVC: Why make a Christmas record? JC: We have been friends for many years and have spent long hours talking to each other about our creative processes and discussing stuff like that. I honestly don’t remember whose idea it was, but sometime earlier this year we said, “You know what would be fun? We could do a Christmas record.” At first we were going to just do covers of Christmas songs because that’s what everybody does. It’s an expected part of your career arc as an artist. Eventually you’ll do the Christmas album. As we started to try to come up with a list of covers that we could stand to sing that were musically interesting, that were nostalgic to us but weren’t kind of gross, like “Jingle Bell Rock,” there weren’t a lot of songs that really fit that bill. There are not a lot of songs that we felt like we could do in a way that wasn’t just, “Oh well, we have to do this song because it’s a popular Christmas song.” That’s when we decided that we would try writing our own and see how that went. It went pretty well pretty quickly, so we decided to finish it up that way and just do all originals. I’m glad we did. Really, who needs another version of “Jingle Bell Rock” at this point?